Hi everyone! Today I wanted to show you a very special polish. This amazing polish was a gift from Kyosuke, thank you sooo much, I love it! Kyosuke has been a faithful and very supportive reader from the moment I started blogging! 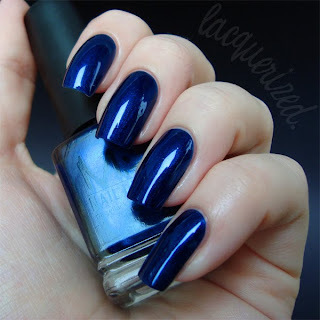 This nail polish by Misa is a true beauty, its name is A Sin Worth Committing and it belongs to the Poisoned Passion Collection that came out in 2008. I'm a sucker for blues, and this one's just perfect, not too dark or light and it's packed with amazing shimmer. This color takes me to far far away lands where stars happily sparkle and the nights never end. To top it all: the application was a dream too, I think Misa nail polishes may have the best formula I've experienced so far. They apply so smoothly and after 2 coats you're done and you can hop back on your carpet with Aladdin!